Hot! That's my main impression of Saturday's session of the North American Organic Brewers Festival, and of the bike ride back home. It doesn't hit 100° very often in Portland: lucky thing there is one tree remaining in Overlook Park. It was pretty big, too, I don't know how the woodmen missed it. It provided enough shade for every single festival goer to cower beneath it between trips to the beer tent. This was the first year I've attended the NAOBF, despite years of good intentions. 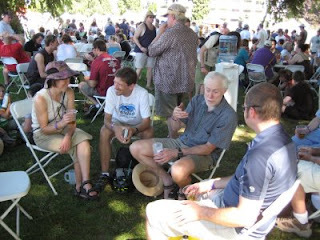 I noticed that a couple of Portland bloggers list the Organic Festival as their favorite -- well, the word Jeff used was "premier" -- and although I had a good time, I can't say I feel the same way. Maybe without the crippling heat; or in a more scenic location. I should be careful what I wish for... Brett was telling me that they had the opposite weather problem last year -- too rainy. I did totally approve of the alphabetical ordering of the brewery stations. A friend of mine taught me this useful saying: "There are exactly two kinds of order in the world: alphabetical order and random order." Please remember that next time you organize a beer festival! Dave noticed it right away, and it was certainly a big help in navigating the festival. Eel River Triple Exultation Old Ale: "awesome". The brewery calls this the "Ozzy Osbourne of Old Ales" -- they should cross-market with Off the Rail. Eel River IPA: "good... no, bad... no, good!". There was so much flavor in this beer that it sometimes rubbed me the wrong way. I need to try a whole pint. Laurelwood Green Mammoth IPA: "very tasty". Laurelwood is at their best when they go big. Fort George Quick Wit: "very nice". Hair of the Dog Blue Dot Double IPA: "oh yeah". Willamette Dunkel: "very nice". This was a spot-on dark hefeweizen. Cloudy, fruity, and delicious. Sasquatch Legacy Project Imperial Vienna: "nice". Very refreshing, which is amazing for an 8.7% lager. Crannog Ales Hell's Kitchen: "nice". British Columbia brewery. They say this is an "Irish Red Ale made with organic potatoes". It was smooth and tasty. I mentioned a few months ago that I had seen Willamette Brewing's unfiltered Amber on tap at the Pizzicato Pizza at the airport, but I didn't get a chance to try it then. The Dunkel was wonderful, and the IPA they had at the NAOBF was also good; keep an eye out for their beer around town. Belmont Station has bottles of some Eel River offerings -- I know I've picked up Triple Exultation before -- and it I think I've seen rotating taps for them in Portland a couple times, but nothing steady that I know of. Overlook Park actually wasn't too bad of a bike ride from the east side. Just connect up with the Interstate bike lane from the Esplanade near the Rose Garden. Hopefully next year it won't be 100 degrees out. Yes! The alphabetical beer set up was genius. And I'm glad to see I'm not the only one that simply says "oh yeah!" in regards to a taste.